Is it worth it for companies to spend millions of dollars a year on software that can't keep up with constantly evolving open source software? What are the advantages and disadvantages to keeping enterprise licenses and how secure is open source software really? 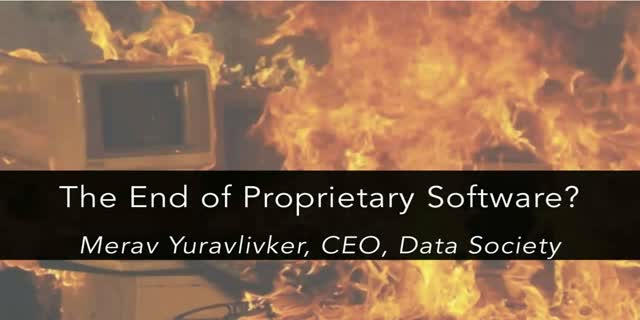 Join Data Society CEO, Merav Yuravlivker, as she goes over the software trends in the data science space and where big companies are headed in 2017 and beyond. About the speaker: Merav Yuravlivker is the Co-founder and Chief Executive Officer of Data Society. She has over 10 years of experience in instructional design, training, and teaching. Merav has helped bring new insights to businesses and move their organizations forward through implementing data analytics strategies and training. Merav manages all product development and instructional design for Data Society and heads all consulting projects related to the education sector. She is passionate about increasing data science knowledge from the executive level to the analyst level.